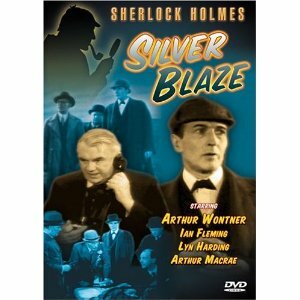 Ian Fleming stared as Watson in four films with Arthur Wontner playing Sherlock Holmes. They started in 1931 with The Sleeping Cardinal (In the US it was called Sherlock Holmes’ Fatal Hour), The Missing Rembrandt (1932), The Triumph of Sherlock Holmes (1935) and Silver Blaze (US title: Murder at the Baskervilles) in 1937. There was a fifth Arthur Wontner as Holmes film, The Sign of Four, but in this case Ian Hunter played the role of Watson. It is curious that Fleming was not used because it was made in 1932. One must assume that Ian Fleming was somehow otherwise engaged. One film, The Missing Rembrandt, is considered a “lost film”. There is no known print. Ian Fleming is not to be confused with the writer of the James Bond books. Very unfortunately computer searches bury the details of this fine character actor under millions of hits for the writer. Fleming really did a sterling job of portraying Watson which would probably not be equaled until Burke or Hardwick in the Jeremy Brett episodes. Fleming comes off as a strong, likeable, intelligent fellow who has more the physique of Doyle’s character. The interplay between Wontner and Fleming is also excellent. There is a real chemistry. It is really unfortunate that the prints of the available films are of such poor quality. These were, in their original form, B movies to begin with. So remember, if you get to watch, look at them for their story and the acting, not so much for the quality of the staging or the print. Ian Fleming was born Ian Macfarlane in Melbourne, Australia on 10 September 1888 and died in London, England on New2 Years day 1969. Fleming acted in over 100 films. He started his formal acting career in 1916 and is one of those character actors that you see in movie after movie and who also made the transition to the small screen. I remember him showing up in the 1950’s TV series Robin Hood as Maid Marion’s father. Fleming was also a consummate stage actor doing everything, including Shakespeare. Fleming was especially busy during the WWII years when he was too old for active service. During that time he made over 40 films. He worked actively in TV until his death in 1969. His last role was as Senius in the TV series The Caesars in 1968.